The reward is a goodwill visit to a local school. Three teams of two compete in the I Love Lucy conveyor belt challenge, with Angela on the bench. It gets pretty crazy once they have five spools on the ramps, but it’s no surprise that Dom and Wendell emerge victorious. They are running the show in all facets right now. They pick Laurel to join them on the visit and send Seabass to Ghost Island. He thinks Dom and Wendell see him as a remora, but he wants to be a shark. A game awaits him, with a three out of four shot at an advantage. He gets the Michaela Steal-a-Vote that Kellyn misplayed earlier in the season. It remains an extra vote. The school visit is the usual feel-good event, with Dom and Wendell confident that they’ve solidified a final three with Laurel. Afterward, Donathan tells Wendell that Dom will have his vote if he ends up on the jury, hoping to pit the dynamic duo against each other. It doesn’t appear to be working. Dom is going to slit his throat with a credit card. 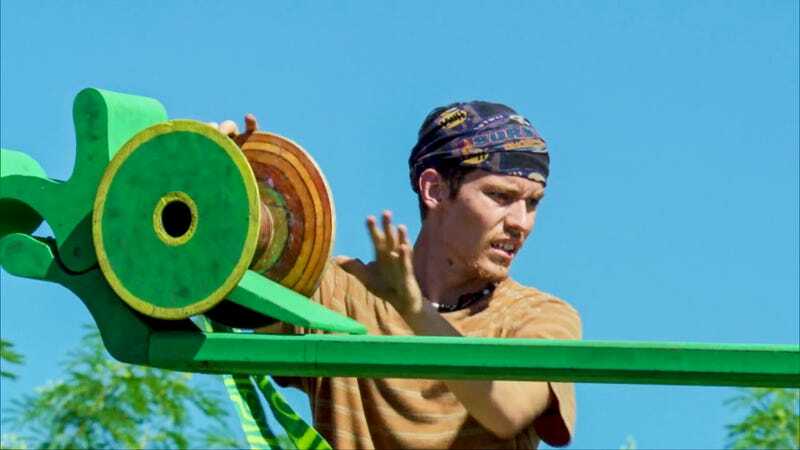 The immunity challenge is a big build-it-and-climb-it deal with a puzzle at the end. Wendell and Seabass get off to a big lead. Wendell apparently finishes first, but he doesn’t call for Probst and Laurel gets the win. I mean, I don’t think Wendell has a case here. He could have been looking over his puzzle and making sure it was all right, and the rules on this have been consistent for many years now. Better call Probst! Laurel thinks it wouldn’t feel right to send Wendell home if he really finished first? Ugh, come on, Laurel. Kellyn is still the target, but Donathan is “imploding on himself.” Wendell has been working on a fake idol and wants the packaging from a real one from Dom. Donathan watches it go down and creates another weird moment. Paranoia is running rampant. Really, what is the point of voting out Donathan? He’s chaotic, but that’s not a recipe for success, especially since he has no numbers. And there’s still no serious talk of booting either Dom or Wendell. There’s a lot of talk about whatever Dom passed to Wendell in front of Donathan. Wendell gets way too worked up about it. Donathan won’t let Dom say something to him. “Stay with the hammock plan.” Okay then! Wendell whispers “three-two split” to Seabass, but I think he needs to be a little clearer than that? The votes are cast, no idols are played, and there is a tie between Kellyn and Donathan. On the revote, Kellyn gets the boot, so that was a lot of sound and fury signifying nothing. It’s going to have to be a hell of a finale to salvage this lame season.